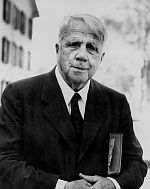 Robert Frost wrote many of his poems on rural life, while living in New Hampshire, and later at his home in Shaftsbury, Vermont. And this year, readers across the state have been learning more about Frost’s life through the Vermont Reads program. The Vermont Humanities Council chose author Natalie Bober’s young adult biography, A Restless Spirit: The Story of Robert Frost as its yearly pick. VPR’s Steve Zind talks with Middlebury professor and Frost biographer, Jay Parini, about Frost’s life and works, and his time in northern New England. A group of young people charged in a December incident in which a former home of poet Robert Frost was vandalized are getting a lesson in Frost as part of their punishment.